Newfoundland Press is proud beyond words to have had the opportunity to publish the poems of this amazing woman. Just before her 90th birthday we issued the expanded second edition - which includes her political poems. Eileen Powell is missed - her poems continue to remind us of her presence in the world. We are dedicating this press to two women, my Mother & her Sister-in law, Eileen Powell, Poet, Activist for Senior Rights, and for the continuing rights of all Veterans. Above you see Newman Gough & Alice (Stead) Gough. In front of the family home, they watch the lens of the Kodak & are blinked into the Internet. From them, their son, Dr. Jim Gough, leaps through life to its end in dad's early sixties. 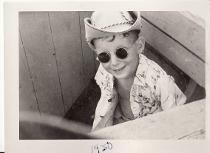 They know what my father wrote about - & that was his life as a Cottage Hospital doctor. I've seen him on horse & sled heading out into winter storms; watched him, grip the railing on the deck of the Hospital Boat John Kent, for seasick or not - he had to get to see his patients. In the old days when he was briefly in Private Practice, I watched him leave a home, and noticed him leaving cash behind from his own pocket. He never spoke of it, he wasn't that kind of person. If I hadn't, from the shadows at the edge of the kitchens of childhood, seen him do the deed, I'd never have known of it. He was NEVER biggoty. Chances are, that before this book you may not have met my father. Well... after his book, you won't forget him. "Doctor Jim: Life & Death" will be published in Spring of 2020. The conversations with my mother on how dad and she approached medicine, and the current state of healthcare is now the spine of my father's powerful and funny and heart-breaking yarn. Gull Pond Books has re-released Ocean of Childhood. .This book, a poem about everyday family life, takes us to an eternal time of summer in Shacktown, it is a One Volume tribute to one Shacktown family, Newman Gough, Alice (Steed) Gough and their Children Jim & Eileen. It's now my farewell poem to Dad and Aunt Eileen. Stand with them in Elliston. As one little girl and her older brother throw stones along the surface of an Ocean. In this poem, the stones skip forever. 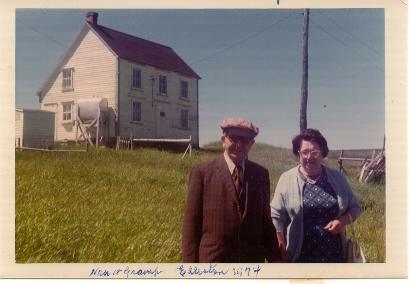 For Ocean Of Childhood - Clik here..
Special Thanks from Newfoundland Press to my mother. Twenty Years ago, a dream began that took me away from my usual work in film and deeper and deeper into completing all the books and scripts I'd put to one side in a long professional career. So, with the help of Caren Moon, I followed my dreams. This could never have happened without the perception expressed in action - by my Mother's belief in what we were doing. Caren, myself and my sister, Bev are still reeling from her death. And we've added my own books under our Gull Pond Books imprint. As the years go on I plan on gathering all my books to this one place. 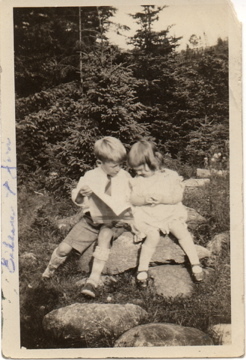 Here's our Gull Pond Books site..
Newfoundland Press will maintain a library of Terra Nova books...The Picture here shows two of our authors...Eileen Powell, and her Brother Dr. Jim Gough who were readers before they also became writers... Both Jim and Eileen have passed away. Each left us books - the invisible are becoming visible. All our first Books are related, circling around a family house, in reality and in fiction. Here's a link to Mom's excellent book about Holloway. Thanks to the Western Star for their photo of Aunt Eileen on the first publication of her poems. Just after we updated and reissued her Book of Poems, Eileen Powell passed away much to the sorrow of all who knew her. In her memory, Newfoundland Press donates all profits to Street People. My Aunt Eileen was an amazingly generous activist for Senior rights. When Eileen Powell gathered her Poems & her daughter, Marilyn Earle, sent them to Newfoundland Press - it was a delight to discover just how many poems, on so many topics, were in one manuscript envelope. 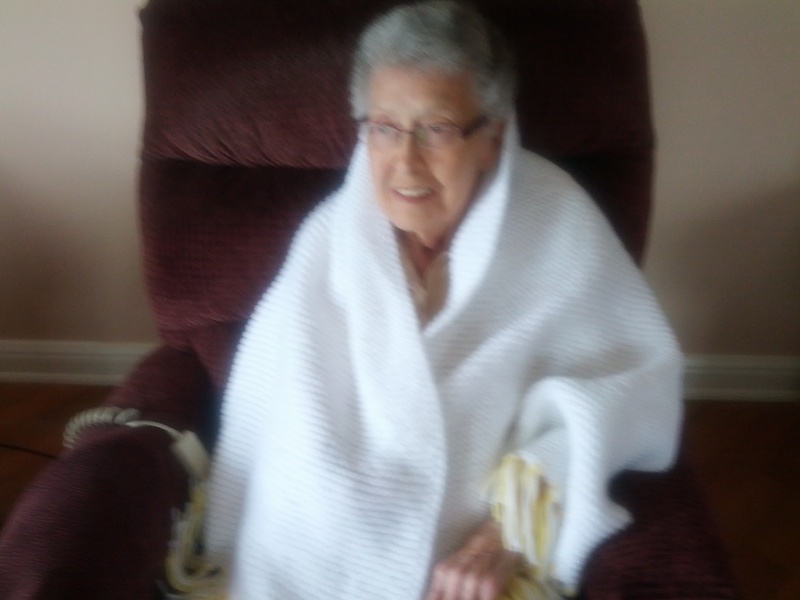 Eileen Powell, for her final years, returned to Corner Brook - her home and turf. Her poems inspired our Development of "Newfoundland Press"; our Lost & Found Division. Here, Caren Moon & I publish books that are truly treasures, and until now - buried treasures. 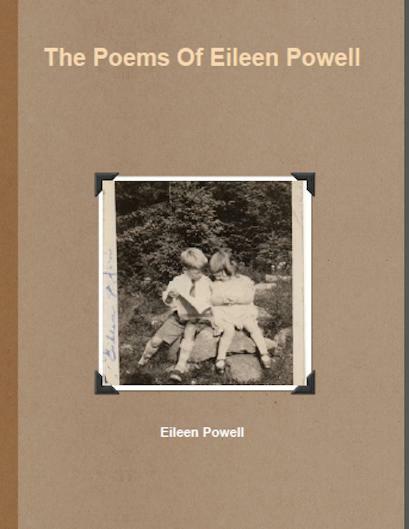 On Dec 21, 2013 we released Eileen Powell's poems to the world. A deliberate choice to reflect the move from shadow to light. You won't have seen these poems before in any collection. This is truly 'Found Poetry' already formed. So, it's fitting that Newfoundland Press ' PHP's First Lost & Found release was from our Aunt, Eileen Powell. We already knew some of Aunt Eileen's poems - but had no idea of how many accomplished poems there were - until we read this manuscript. As a child, I always loved it when Aunt Eileen & Uncle Jim arrived for a visit - lots of stories, fun playing with all my cousins & hearing Uncle Jim speculate about politics & the world. I knew Aunt Eileen was one of the first women in the family with a career, I admired how she'd become a Nurse & loved her stories of her work. She's always been a poet. With bread baking, and the wonderful smell of home-made cooking filling her Laite's Lane House in Corner Brook, she scribbled, & anywhere that Aunt Eileen went, she found a space where she could set down her musings. Those who knew her as an activist for seniors will get to meet the woman who has lived a life in many realms - all the time writing about the world as she saw it. We didn't want such delights to be lost & so we found our way to the first Lost & Found release at Newfoundland Press. Without my Mother I would not be the person I am, nor would I have been able to do all I've done, Without her emotional support of everything that Caren and I have been doing, it would not have been possible. Nor could it have occurred without the clear understanding that she would never let us starve. The way a Dream may still stay with us when we wake up, can happen only if someone, (in this case, my Mother) pitches in whenever times grow tough. We co-dedicate Newfoundland Press to my mother, and to her belief in the Arts. 2017 saw the release of the new Edition of "Shinto Poem Field"
It included my poem for my mother Ruby Gough, for my Father-In-Law, Ken Lyons, and for the wonderful director, my friend, Martin Lavut. ...this book that means "the world" for me.